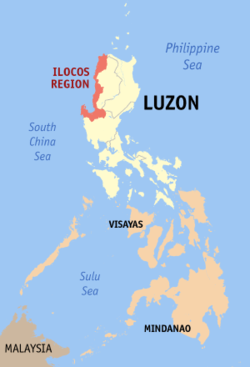 The Ilocos Region (Ilocano: Rehion/Deppaar ti Ilocos; Pangasinan: Sagor na Baybay na Luzon; Filipino: Rehiyon ng Ilocos) is an administrative region of the Philippines, designated as Region I, occupying the northwestern ection of Luzon. It is bordered by the Cordillera Administrative Region to the east, the Cagayan Valley to the northeast and southeast, and the Central Luzon to the south. To the west lies the South China Sea. The region comprises four provinces: Ilocos Norte, Ilocos Sur, La Union and Pangasinan. Its regional center is San Fernando, La Union. The 2000 Census reported that the major languages spoken in the region are Ilocano at 66.36% of the total population at that time, Pangasinan with 27.05%, and Tagalog with 3.21%. Region 1 was first inhabited by the aboriginal Negritoes before they were pushed by successive waves of Malay/Austronesian immigrants that penetrated the narrow coast. Tingguians in the interior, Ilocanos in the north, and Pangasinense in the south settled the region. Before the administration of Ferdinand Marcos, Pangasinan was not a part of the region. The Spanish arrived in the 16th century and established Christian missions and governmental institutions to control the native population and convert them to Catholicism. Present-day Vigan in Ilocos Sur province became the diocesan seat of Nueva Segovia. Ilocanos in the northern parts were less easily swayed, however, and remained an area filled with deep resentments against Spain. These resentments bubbled to the surface at various points in the Ilocos provinces' history as insurrections, most notably that of Andres Malong and Palaris of Pangasinan, Diego Silang and his wife Gabriela Silang in 1764, and the Basi Revolt in the 19th century. However, it was the Pangasinenses in the south who were the last to be stand against the Spaniards. In 1901, the region came under American colonial rule, and in 1941, under Japanese occupation. During 1945, the combined American and the Philippine Commonwealth troops including with the Ilocano and Pangasinese guerillas liberated the Ilocos Region from Japanese forces during the Second World War. 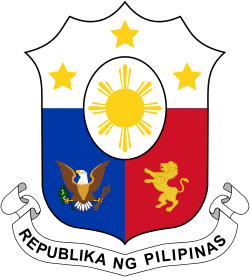 Several modern presidents of the Republic of the Philippines hailed from the Region: Elpidio Quirino, Ferdinand Marcos, and Fidel V. Ramos. 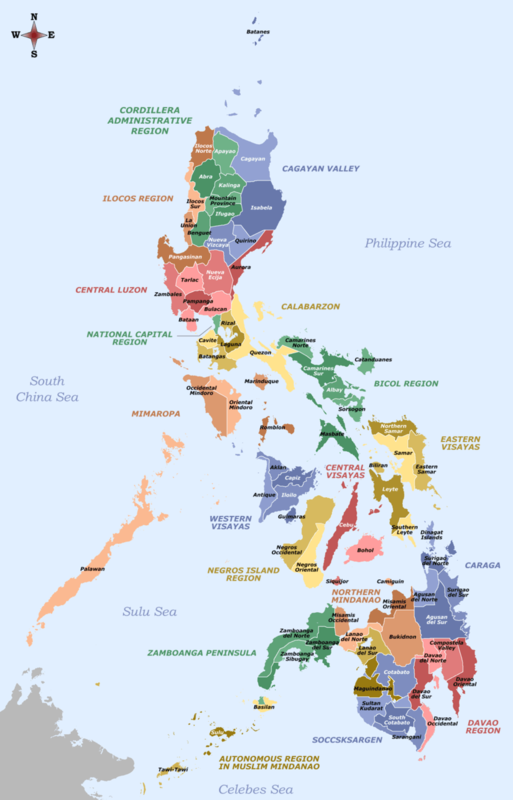 Before the creation of the Cordillera Administrative Region, Region 1 included the provinces of Abra, Mountain Province, and Benguet. The Ilocos Region occupies the narrow plain between the Cordillera Central mountain range and the South China Sea, and the northern portion of the Central Luzon plain, to the north-east of the Zambales Mountains. Lingayen Gulf is the most notable body of water in the region and it contains several islands, including the Hundred Islands National Park. To the north of the region is Luzon Strait. The Agno river runs through Pangasinan flowing into a broad delta at the vicinity of Lingayen and Dagupan before emptying into the Lingayen Gulf. The Ilocos Region comprises 4 provinces, 1 independent component city, 8 component cities, 116 municipalities, and 3,265 barangays. • Figures for Pangasinan include the independent component city of Dagupan. • Coordinates mark the city center, and are sortable by latitude. Although the economy in the southern portion of the region, esp. Pangasinan, is anchored on agro-industrial and service industry, the economy in the northern portion of the region is anchored in the agricultural sector. The economy in Pangasinan is driven by agro-industrial businesses , such as milkfish (bangus) cultivation and processing, livestock raising, fish paste processing (bagoong), and others. Income in the Ilocos provinces or northern portion mostly come from cultivating rice, tobacco, corn, sugarcane, and fruits; raising livestock such as pigs, chicken, goats, and carabaos (water buffalos). The distribution of the economic activity in the region may be seen from the collection of tax revenue of the national government. The bulk of the collections come from Pangasinan, which posted 61% of the total. The service and light manufacturing industries are concentrated in the cities. Dagupan is mostly driven by its local entrepreneurs, which have started to expand its network up to the national level. San Fernando in La Union also has an international shipping port and the upgraded and soon to be developed San Fernando International Airport. While Laoag in Ilocos Norte has an international airport. The tourism industry, driven by local airlines and land transportation firms in the area like Farinas Transit Company and Partas, focuses on the coastal beaches and on eco-tourism. There are fine sands stretching along Bauang, La Union and the rest of the region. The region is also rich in crafts, with renowned blanket-weaving and pottery. The Ilocanos' burnay pottery is well known for its dark colored clay. The Ilocos provinces are the historical homeland of the Ilocanos. In the 2000 Census, the Ilocanos comprised 66% of the region, Pangasinan people 27%, and the Tagalogs 3%. Pangasinan is the historical homeland of the Pangasinenses. The population of Pangasinan comprises approximately 60% of the total population of the region. The Ilocanos started migrating to Pangasinan in the 19th century. Pangasinan was formerly a province of Region III (Central Luzon) before President Marcos signed Presidential Decree No. 1, 1972, incorporating it into Region I. Minority groups include the Tingguian and Isneg communities that inhabit the foothills of the Cordillera mountains. The population is predominantly Roman Catholic with strong adherents of Protestantism such as the Aglipayan denomination further north of the country. There are also adherents to other Christian denominations, such as Iglesia ni Cristo, Mormons, and the like. There is also an undercurrent of traditional animistic beliefs especially in rural areas. The small mercantile Chinese and Indian communities are primarily Buddhists, Taoists, and Hindus. 1 2 3 Census of Population (2015): Highlights of the Philippine Population 2015 Census of Population (Report). PSA. Retrieved 20 June 2016. 1 2 "Ilocos Region: To Reach Five Millionth Mark in Nine Years (Results from the 2000 Census of Population and Housing, NSO); Table 8. Language/Dialect Generally Spoken in the Households: Ilocos Region, 2000". National Statistics Office. 31 January 2003. Archived from the original on 28 April 2003. Retrieved 29 March 2016. ↑ "List of Regions". National Statistical Coordination Board. Archived from the original on 2008-10-27. Retrieved 9 January 2011. ↑ "PSGC Interactive; List of Provinces". Philippine Statistics Authority. Archived from the original on January 21, 2013. Retrieved 30 March 2016. ↑ "PSGC Interactive; List of Cities". Philippine Statistics Authority. Retrieved 29 March 2016. ↑ "Population and Annual Growth Rates for The Philippines and Its Regions, Provinces, and Highly Urbanized Cities" (PDF). 2010 Census and Housing Population. National Statistics Office. Archived from the original (PDF) on September 28, 2013. Retrieved 9 August 2013. 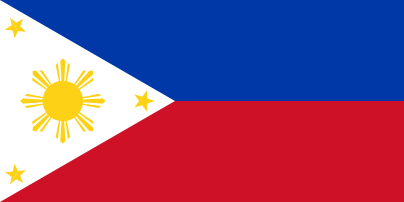 Wikimedia Commons has media related to Ilocos Region.